After so many visits, attending Suerte glamorous launch party and witnessing her build, it was with some excitement that we finally boarded Suerte for her maiden voyage. Docked stern-to the shipyard’s 250m long dock we took a moment to admire what I’d describe as her ‘modern classic’ lines. In her Francesco Paskowski has again achieved the timeless elegance that makes his talent and time so jealously sought after. Boarding her 10’ deep bathing platform one is faced with an expanse of tinted glass flanked by symmetrical staircases leading up to the cockpit. We mused how the sliding glass doors that open into an oversized beach must have been something of a challenge to get approved by the class surveyors, until it was explained that the entire beach club had been constructed as a watertight compartment. In fact, in their typical ‘belt and braces’ approach, Tankoa worked with two classification organizations in the build of Suerte: Lloyds and RINA. The beach club itself is a vast reception area furnished with a comfortable L-shaped teak and linen sofa, wet bar and TV. To the starboard side of the internal companionway leading directly into the main deck is the sauna, complete with a chilled water shower–the temperature can be lowered to a ‘refreshing’ 39° Fahrenheit (4° Celsius). In the event the shower proves too chilly, alongside the sauna is a drop-down terrace in the hull that allows guests to dive directly into the ocean. On the portside is a Turkish bath and another hull opening that acts as a massage terrace for relaxing waterside treatments. I raise my concern that, usually on yachts, the exhausts for the generators exit at water-level forward of the terraces (and they are therefore downwind when the yacht is at anchor). Yacht-Ology’s build engineer Albert McIlroy grins his ‘we’ve thought of everything’ smile and explains how not only are the exhausts switched through the stack when the terraces are deployed, but the yacht is also equipped with soot burners; thus exhaust gasses are not only invisible and don’t smell, but one will never see soot floating on the surface of the water. Incidentally, on the lower deck is also access to the tender bay, where the yacht’s two 24’ (7.5m) Dariel tenders reside. Ascending the slate-lined companionway up to the main deck, first-time visitors will be surprised not to enter a main salon; instead emerging into a stylish Japanese style winter garden, entirely enclosed in glass and featuring a bar fabricated from an aircraft wing. The intimacy of the space is deliberate, with Paszkowski fashioning the general arrangement to create compact and private spaces, rather than vast impersonal expanses. The absence of an aft entry into the main deck is also very deliberate. With the traditional access guests and crew are often irritated–and AC system overworked–by the constant opening and closing of the big glass doors whenever someone walks by the electronic motion sensor. The lateral access also affords two small seating areas to either side of the Japanese Garden’s staircase, creating a true reception area feel upon entering the main deck proper. Proceeding forward one is next enveloped by the relaxing ambience of the main salon that also acts as a library or cinema for up to 20 people. At the touch of a button the entire space can be closed off by glass panels and darken by curtains. The TV– an 88” curved LED by Samsung–is recessed on the starboard side into the slate liner. The slate blends perfectly with the richly carved wood headliner and the silk-touch finish of teak panels used elsewhere in the decoration. The onboard domotic system has been specifically designed for intuitive guest control of their environment via tablet: everything from the movie library to sound levels, lights, climate control, curtains and more has been integrated by Faser; a company with a great deal of experience in such work within the yachting industry. In an innovative touch, a saltwater aquarium (with water stabilization system) forms part of the partitioning between the TV saloon and the huge dining room. The subaquatic theme continues in the delightful chromed bubbles above the dining table, which itself is cutom made from Jerusalem stone, light and dark piano lacquered oak, and is served by up to 16 Poltrona Frau dining chairs. As in the Japanese Garden, the louvres of wonderfully oversized Venetian blinds dress the full height windows, but the space’s piece de resistance is the glazed wine cellar: a sole-to-ceiling display in which the owner can showcase choice bottles from his onboard collection. The main cellar can of course be accessed by the crew who enjoy full privacy while circulating in a column of pantries on each deck of the port side of the yacht. The interior decoration was placed in the charge of Margerita Casprini at Paskowski’s studio, who explained to me later that the owner’s brief was very concise: the interior design was to be contemporary, but as warm as possible and was to maintain a subtle marine element, thus the extensive use of teak onboard. The starboard corridor that leads to the main lobby features a day head and cloakroom, so guests boarding from the starboard gangway can deposit their belongings with a stewardess. The wide electronic lateral access faces an elevator dressed in neutrally colored hard leather panels that have been stitched ‘couture style’, while overhead the ceiling comprises of a 3D pattern of white lacquered wood cubes that combine for spectacular effect. The entire remaining space forward of the main deck is devoted to guest accommodation. The central corridor dissecting two VIP suites with queen beds, two twins with single beds that can slide to convert into a queen, and leading forward to the primary VIP suite that could happily act as a second owners in the event of two families chartering the yacht. Here the masculine styled cabin with carbon fiber elements is located to starboard, with an onyx dressed en-suite, complete with stand-alone bathtub to port. As I discovered once underway, the four guests cabins, due to their location on the main deck, are extremely quite and benefit from oversized windows instead of the usual portholes, so spending time in one’s cabin when cruising the passage is as pleasurable as arriving at the destination. The décor matches the rest of the boat and truly reflects the rejuvenating atmosphere one experiences throughout Suerte. The bathrooms are dressed with plenty of white Carrara marble, black marble slates and white lacquered panels to compliment the teak found elsewhere. 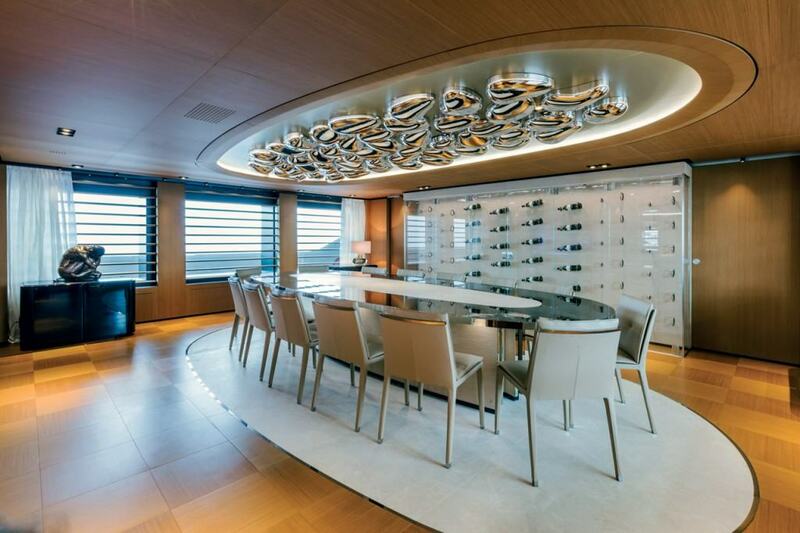 The lower deck is entirely devoted to the ten crew cabins and infirmary. Following the old adage ‘happy crew, happy owner’ their cabins are extremely generous and finished to a very high standard with common areas also finished in teak. The crew have direct access from their quarters to two stairwells; one leading up through each of the deck pantries, the other leading to the guest accommodation corridor on the main deck and the owner’s suite corridor on the upper deck. 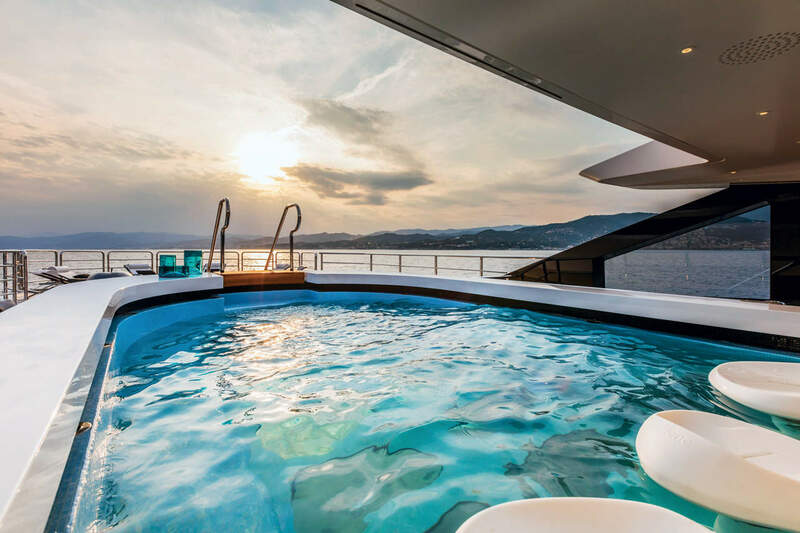 Rather than the crew access, we took the guest elevator up to the second lobby on the owner’s deck, where we found a panoramic saloon that can be partitioned into three separate sections or left open plan as the situation dictates. To port is a sushi bar with high top along the windows, with direct access to the pantry and a regular table. The central dry stack column–a solution incorporated to reduce engine and generator exhaust noise–is dressed to fore in Jerusalem stone panels while the sides are covered with black leather stitched panels, The glass mirror inserts conceal Ad Notam TV displays. To starboard an ingenious system of concealed sliding partitions allow a seventh cabin to be created if so desired; the sofa coverts into a bed and the hidden day-head/shower becomes an en-suite for single guests or supernumerary staff. Aft of this space is a saloon with a baby grand piano and sofas facing a 90” LED TV recessed into slate covered background. 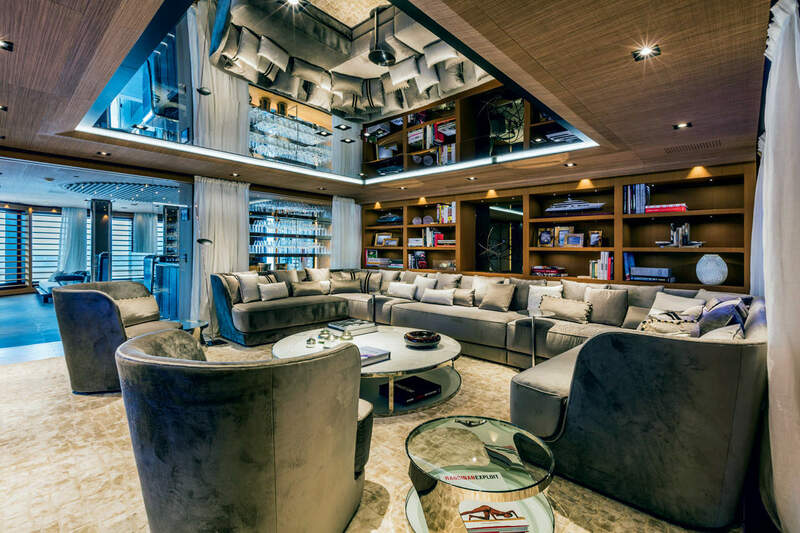 The bio-ethanol fireplace below the TV makes this a cozy space at night, but during the day one can enjoy another of the yacht’s unique features: light shimmers in through eight transparent glass panels in the ceiling that also form a section of the swimming pool located above. The aft deck features an al fresco dining area, perfectly protected even in inclement weather by the lateral glass in the superstructure. The two L-shaped sofas of the lounge area enjoy protected and uninterrupted panoramas aft courtesy of the glass panels beneath the cap rail. The entire forward section of this deck is devoted to the owner’s staterooms, where one finds a day head, private office, walk-in dresser and bathroom. The cabin, occupying the very forward part, features a raised platform for the bed so occupants can enjoy the views afforded by the 180-degree windows that surround the area. Two Opacmare electric pantographic side doors private access to the private foredeck where the owner can relax in the Jacuzzi, repose on the sunpads or lounge on the accompanying 20’ (6m) long sofa with built-in fridge for self-service cold beverages. Proceeding to the upper deck one is surprised once again by stumbling into the gym, with its lofty head room and overhead skylights it’s far from the compact sweat boxes one can find on yachts. But that’s not the true surprise in this area, for there’s also another curious small 2-person elevator. Intrigued we entered it and rode up to the crow’s nest, where we found a deliciously private sunpad. In fact, it is so private and well concealed that even when you know it is there you have to hunt for it in photographs. Forward of the gym is the wheelhouse, while aft leads out to a 16’ (5m) long heated swimming pool with swim-up bar. A waterfall blade that cascades into the pool supplies the soporific sound of falling water, and when this is switched off a TV screen can be installed… I can’t think of a better place to be watching a game! Aft of the pool are two gigantic sun pads set out on a touch-and-go helideck that can support aircraft up to 4.5 tons. This larger than usual capacity allows twin turbine helicopters such as an Augusta 109 or EC 145 to drop or collect passengers. At night, when the helideck is not in use, it transforms into a dance floor complete with DJ booth. Having visited Suerte so many times during her construction I was delighted to see the yard’s unstinting attention to quality engineering has been maintained right the way throughout, even to the impeccable nature of the paint and finish. The white hull and superstructure gleam with virgin purity, while gloss black painted sections of the superstructure–notoriously challenging to get right–are also free of defects. Thankfully for the purposes of this review, the maiden passage for the delivery from Genova to Cannes was not a genteel cruise over a millpond. Swell between five and eight foot persisted for most of the short passage, driven on by headwinds that fluctuated between 20 and 30-knots.